The Lebanese artist’s first US retrospective reveals a haunting mythology of lands in ruins and new beginnings. In Hesiod’s “Works and Days” (c. 700 BC), the Greek poet illustrates his advice to his idle brother Perses, praising the merits of honesty and hard work, and describing the curse of sorrow that gods unleashed on men after Prometheus stole fire from Zeus. Later, when Pandora releases all the evils of mankind from a jar deceptively gifted to her by the gods, only hope (Elpis) remains trapped. The poem describes the five successive ages of man, from the abundant and harmonious Golden Age, then Silver Age, to the destructive Bronze Age, the noble Heroic Age when warriors save the world, and finally, the miserable, shameless, dishonorable, enduring Iron Age. 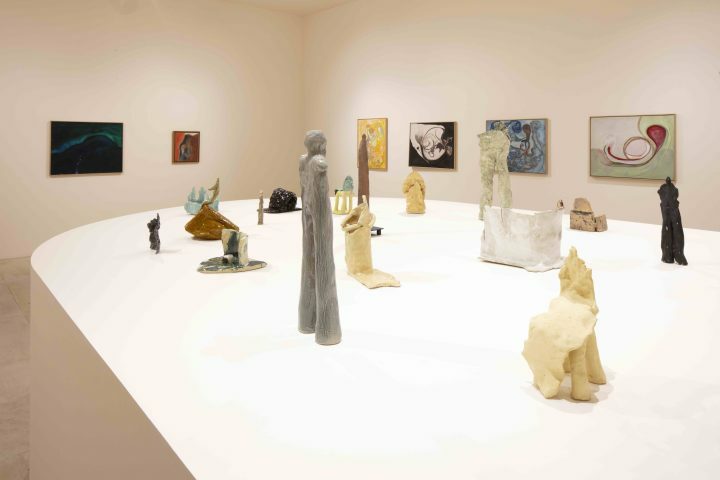 While MoMA PS1’s exhibition dedicated to the Lebanese artist Simone Fattal is titled after Hesiod’s poem and depicts humanity’s deepest tragedies and fiercest heroes in an epic of war and suffering, it is also imbued with undying poetry and hope in the face of history. 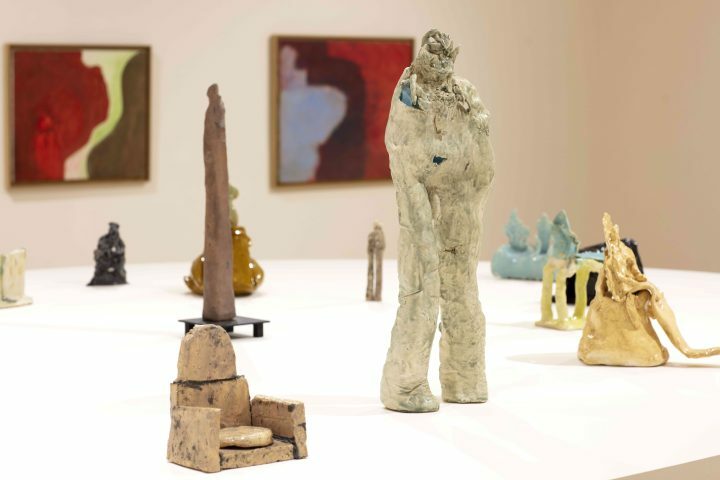 Fattal, who was born in 1942 and began to sculpt after leaving war-torn Beirut for California with her partner Etel Adnan, found in clay the life that she was desperately seeking after a brutal exile. She chiseled a found block of opalescent, flesh-toned alabaster into a torso, mounting it on a makeshift wooden pedestal and naming it “Torso found in Today’s Downtown Beirut” (1988) to immortalize the fallen bodies and abandoned ancient sites of the city. 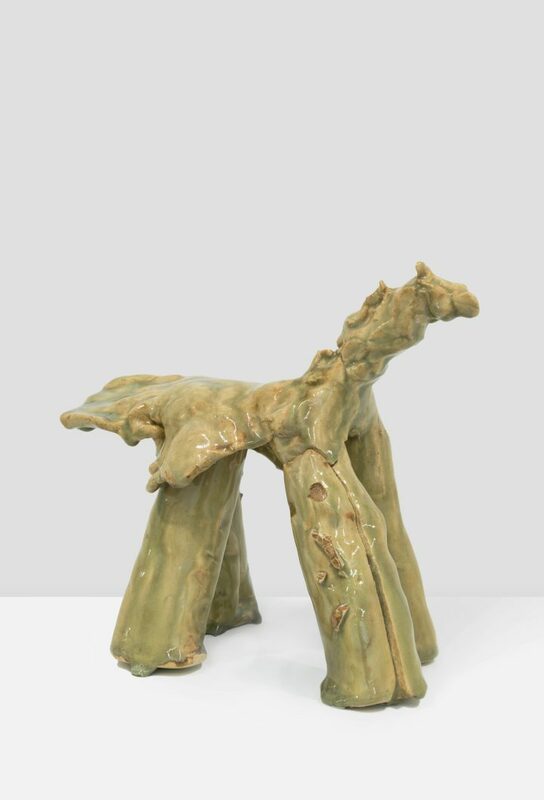 This sculpture, her very first, evoked the sensual lines, abstraction, and luminosity of her earlier Sannine Mountain paintings, in which the artist rendered Lebanon’s towering peak with washes of white and bursts of sunny primary tones. 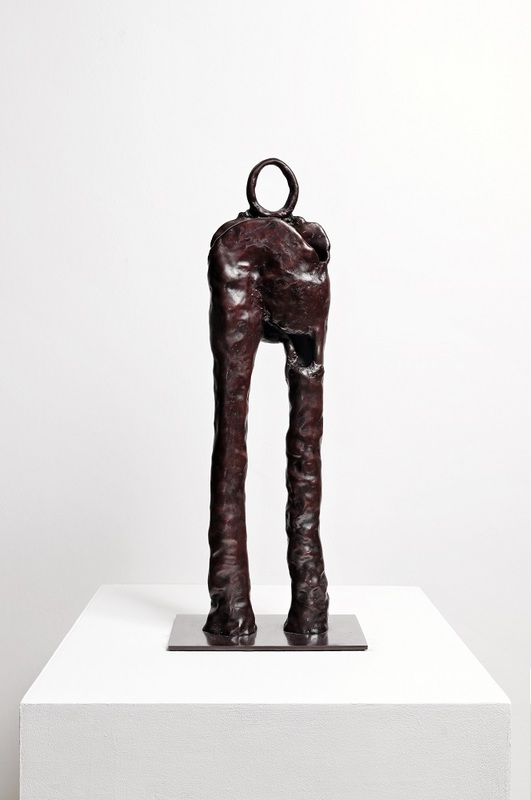 Through sculpture, for the first time, her work represented humans. She then gave shape to a tiny Adam and Eve couple, marking the beginning of lust and the curse of humankind; she later crafted a miniature apple. Impulsively, she molded rugged, delicate objects — sirens, horses, trees, fruits, lions, houses — building an imaginary of loss and love. Steeped in ancient myths from Mesopotamia and the Mediterranean, this world is ruled by the thick, monumental warrior sculptures of Gilgamesh, Enkidu, and other epic heroes that inhabit Fattal’s mind. They are at once heavy and fragile, eternal and ephemeral, organic and manufactured. Their edges are often left unfinished; they are sometimes pierced or wounded; and they are glazed with washes of soft earthy hues. The urge towards abstraction which runs through the artist’s work transforms these vestiges into monuments, memorials, temples, and totems. 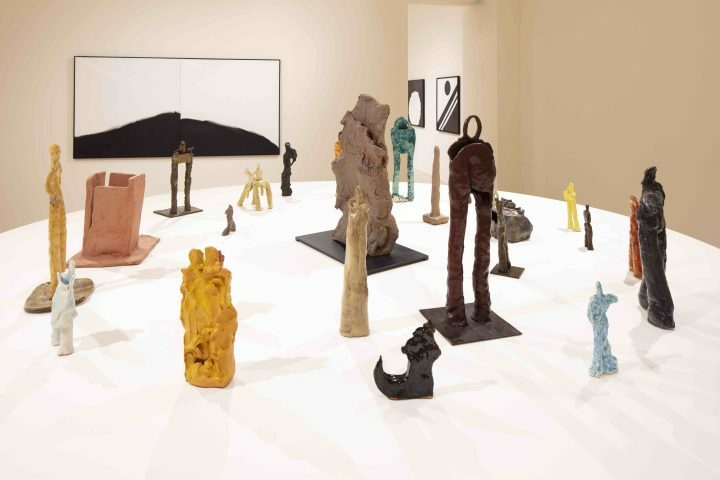 Syrian-American curator Ruba Katrib’s bold exhibition design emphasizes this archeology by grouping sculptures together on ziggurat-like steps, columns, and pedestals. She also juxtaposed them with the artist’s paintings and collages, creating a semi-mystical movement of calligraphic lines, fluid forms, and radiant colors. The exhibition design itself is circular, never falling into chronological considerations or endings. The central exhibition space, filled with abstract black and white paintings and four massive warrior sculptures, exudes a particularly powerful graphic and spiritual dynamic. While the artist herself is absent from these works, “Self-Portrait 1972-2012,” a video projected in the basement theater, reveals the radical, rebellious nature of a woman who broke the rigid molds of her time for a life of freedom, intellect, and creativity. A young, nonchalant, neurotic Fattal speaks to a camera recorder on matters of love, art, and philosophical pursuits. 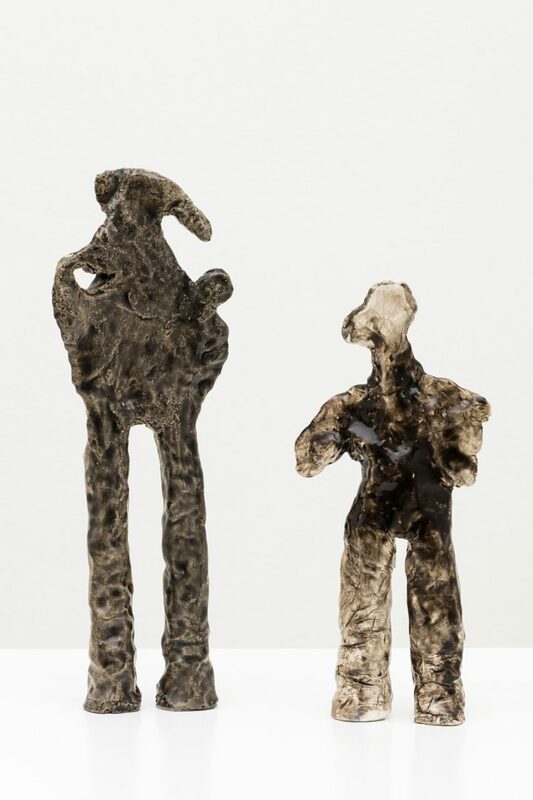 The Damascus-born artist was raised in a Beirut boarding school before attending the city’s École des Lettres to study philosophy and then continuing her studies in Paris. She returned to Lebanon in her twenties filled with dreams and projects; she took up painting in 1969 and met Etel Adnan, among other artists and thinkers in a city ripe with idealism and creativity. Moving to San Francisco after these traumatic experiences, Fattal stopped making art from 1980 to 1987 and founded the Post-Apollo Press, publishing an English translation of Adnan’s seminal wartime novel Sitt Marie Rose and several poetry books. Soon after was when Fattal took up ceramics and discovered her profound connection with clay. 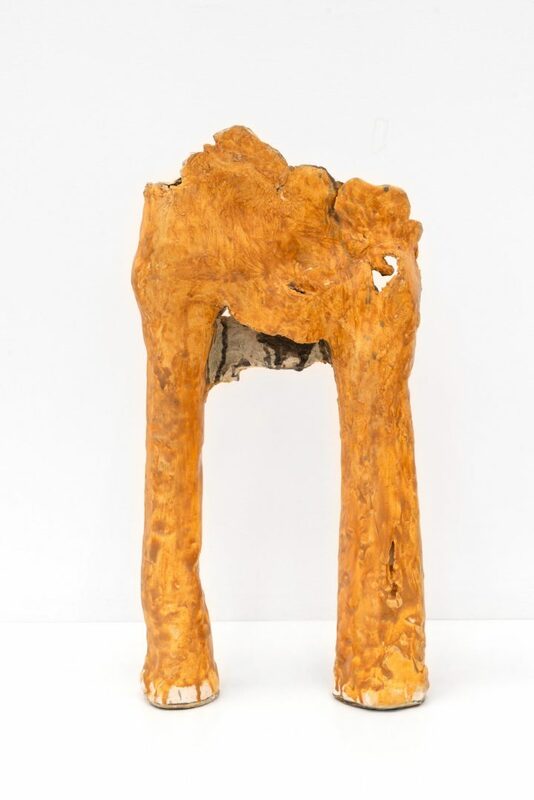 Inspired by her lifelong obsession with archeological sites from Iraq, Syria, and Lebanon, Sufi poetry and Islamic art, she created a sculptural language of her own. Simone Fattal: Work and Days, curated by Ruba Katrib and Josephine Graf, runs through September 2 at MoMA PS1.